Honorable Ministers, Governors of the Bank, Distinguished Guests, Partners, Ladies and Gentlemen. Mr. Chairman, Minister Arun Jaitley, congratulations on successfully shepherding this 52nd Annual Meetings. The way you efficiently chaired all our statutory meetings has been impressive. We are grateful to you and your staff in the Ministry of Finance of India for a job well done! From the Communiqué it is clear that you have all worked so hard. It is amazing how fast time has gone by. Four days ago we arrived here in Ahmedabad for our 52nd Annual Meetings. It has been a marathon of meetings and deliberations: we have run well, discussed well, and interacted well. From the opening ceremony, the tone was set: we should think big, act bold, and deliver faster development for Africa. Prime Minister Modi showed us in his speech that there's nothing that can be called impossible. From this same ground that honors the memory of Mahatma Gandhi, we must take with us his words "be the change you want to see". For the change we want to see in Africa lies with us. Upon us lies the responsibility to rise to the occasion of giving Africa a new history: by lighting up Africa, feeding Africa, industrializing Africa, integrating Africa, and improving the quality of life of the people of Africa. The Annual Meetings' focus on transforming agriculture to create wealth has sparked political leaders, young people, researchers, private sector, bankers, and of course you, the Ministers of Finance, and Governors of the Bank, as well as the Central Bank Governors who came, to take agriculture as a business. This Annual Meeting has also been a huge success in several other ways. We were not bothered by the heat, we simply generated cool ideas. We have not just focused on economics and finance, we brought in other voices. I was excited at the cultural night yesterday to meet Nollywood and Bollywood actors and actresses who told me they will now focus on movies that will help change the perception of agriculture, for young people. That is one of the successes I am taking home. And the coolest person around was Prime Minister Modi. His presence, participation and support for these Annual Meetings in Ahmedabad made it such a great success. We had two African Heads of State, from the Republics of Benin, and Senegal, a Former Head of State of Ghana, and the Vice-President of Côte d'Ivoire. Their presence sent a very strong signal that African leaders back the African Development Bank. And that is because the African Development Bank is Africa's trusted Bank of choice. You, the Governors of the Bank made all the difference. The Meetings are your Meetings: for you to see the African Development Bank at work, working for the greater good and benefits of the people of Africa. You saw the impacts of our High 5s in Africa. Not just in terms of money we lent to countries or the private sector, but in terms of real people-level impacts. We measured those impacts, not as numbers, but as lives transformed. You saw some of those stories yesterday as we celebrated countries and governors from Morocco, Mauritania, Ghana, Somalia and Tanzania at the "Africa Development Impact Awards" - our own Oscars for development. But the best awards go to you all for coming to our Annual Meetings. Your contributions, engagements, ideas, and suggestions will help us to become even better in what we do. 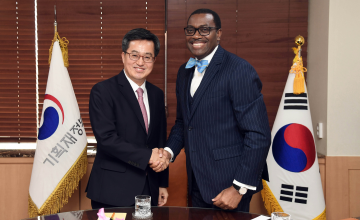 "Aside from the 2017 Winter Olympics, the Annual Meetings of the African Development Bank this May in Korea, is the most important event on our calendar," says Deputy Prime Minister and Minister of Strategy and Finance, KIM Dong-yeon. The Republic of Korea will host the 53rd Annual Meetings of the African Development Bank Group in the port city of Busan on May 21-25, 2018. Korea has a long history of supporting African development. It joined the Bank in 1982, and has significant status as a recipient-turned-donor country. The Government of India deserves a big High 5: the organizations of the events were excellent. We are grateful for the great work of the Chief Minister of Gujarat and members of the Government of the State of Gujarat. The people who did the setting up; the electrical folks who worked late nights; the protocols and security who ensured our safety at all times, even late at nights; the media who told our stories; the wonderful cooks who fed us so well. To Prime Minister Modi, a very big thank you for hosting us and honoring us with your presence and for your very warm words: let us make history together for Africa. To all my staff at the African Development Bank, who worked tirelessly, thank you so much. To Nnenna Nwabufo, Célestin Monga and Vincent Nmehielle, you made it all happen and thank you so much. To the translators, who worked tirelessly, sitting unseen in their cubicles, you made it so seamless for us to conduct our business, and understand each other - thank you. Above all, I am thankful to you, our Governors and Executive Directors who continue to give us support in our work and for our mission. In my town hall discussion with you, our Governors, yesterday, you voted an overwhelming 97% that there is need for urgent actions to finance the High 5s. No doubt, boosting the Bank's general capital along with all other measures to optimize our balance sheet, will help us with more equity to leverage more to get the job done. We work so hard to earn your trust and you can trust us that we will continue to deliver more, better, and faster for Africa, with additional capital resources. As a Bank let me assure you we will continue to be fit for purpose. The achievements we have had so far, in just under two years, on the High 5s and our reforms, show that we are moving in the right direction and solidifying the income, efficiency, effectiveness and development impacts of the Bank. Yet the road is still long to achieve our goals, but we are determined, with your support, to stay for the long haul. We hope you are leaving more inspired about the Bank; and ask that you, as Governors, be our strong advocates and champions for accelerating financing for the High 5s. Let us continue to be optimistic for Africa and let us continue to be optimistic about the capacity of this Bank to deliver. At the Bank, we believe Africa can and will achieve the High 5s. But we must always be forward looking and raise the bar on our ambitions for financing Africa to address its challenges and unlock its opportunities. What we need is "bold optimism": optimism backed by greater financial resources. That is the kind of optimism that made Warren Buffet give $30 billion to the Bill and Melinda Gates Foundation in 2006, to do more for the world. Melinda Gates, writing ten years later to Warren Buffet, said: "optimism isn't a belief that things will automatically get better, it is a conviction that we can make things better....Your success didn't create your optimism. Your optimism led to your success". So, let "bold optimism" from this Annual Meeting in India bubble and inspire us to accelerate financing, urgently, for the High 5s for Africa. And let that "bold optimism" be fully concretized and solidified by the time we meet in Korea next year for the 2018 Annual Meetings. I congratulate Korea for being the host country for next year's Annual Meetings. I look forward to seeing you all next year in the beautiful city of Busan for our 53rd Annual Meetings. Until then, safe travels back home - and, as you go, here is a High 5 for you all!